I am in love with my dining room chairs. You’ll hear me say this about pretty much everything that is found in our dining room, but as I said in an earlier post – the dining room is my favorite room in our house, so I really do mean it when I say it. When I bought the dining room table way back when, I decided to buy only four chairs from the same set because I wanted a mix of chairs at the table. It only took me about 4 years to finally have a set of 10 that I was proud of, and who knew that the additional 6 chairs would come from a garage sale? 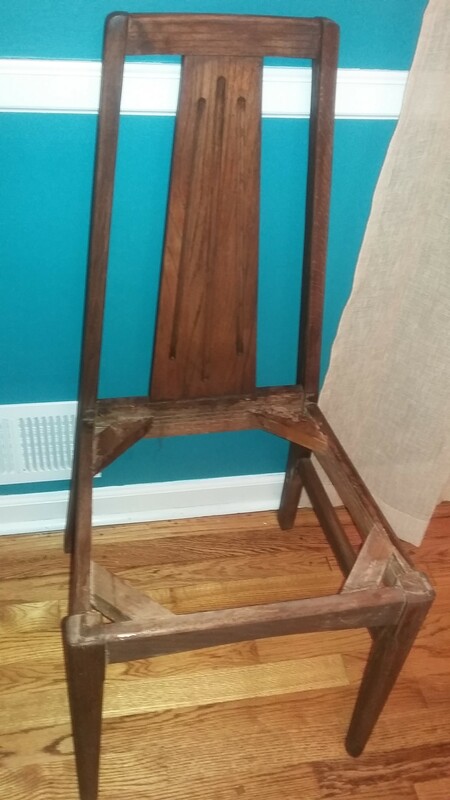 Thanks to my mom’s keen eye, she picked up the chairs knowing that they had potential. Thanks Mom. 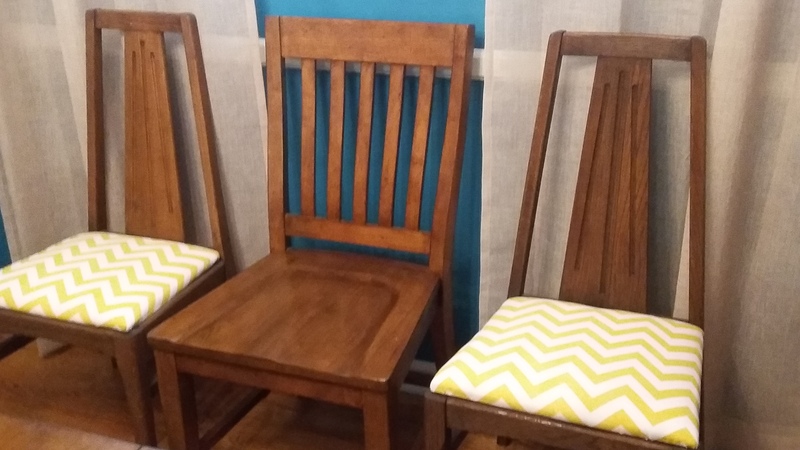 I don’t have a before picture (go figure), but the chairs were a very light-colored wood and the cushions were covered in black vinyl – oh yeah. The chairs themselves were such a cool design though and I was excited to get my hands on them. Deciding on a stain color for the chairs was fun, or not. I found myself standing in the stain aisle at Home Depot just staring, for God knows how long, as if waiting on a can of stain to come flying out at me. I should mention that I am so appreciative of my husband’s patience with me; however, we’ve both learned over the years that if I don’t know the exact item or items that I want at a store when we run errands, it’s just better for both of us if I go to the store alone. It’s pretty sad when he’s gathered the other 12 items on our list and I’m still looking at stain colors. Why are there so many? 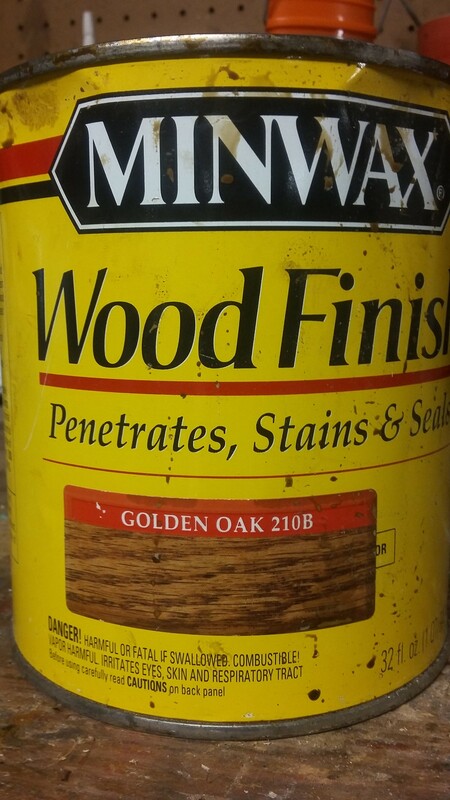 Somehow I finally settled on Minwax Wood Finish in Golden Oak 210B, and I think it was a pretty good choice. Picking a fabric for the cushions was a little more fun … more time-consuming, if you can believe it, but definitely more enjoyable. 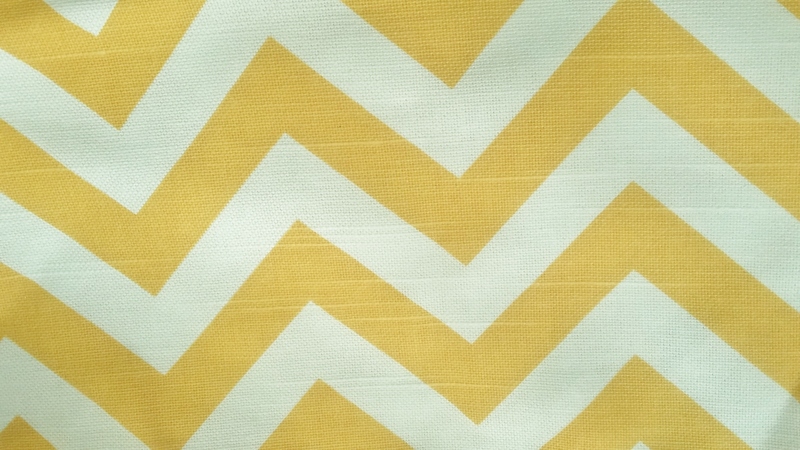 My mom and I scoured fabric stores and I brought home probably 18 fabric swatches before deciding on a yellow zig zag stripe fabric from Hancock’s. Being that the dining room was giving off a vintage farm-house feel after finally redoing it, I thought a pop of modern would be perfect. The original price of the fabric was $24.99/yard but knowing that Hancock’s puts their fabrics on sale quite often, I waited until it was marked down to $14.99/yard. 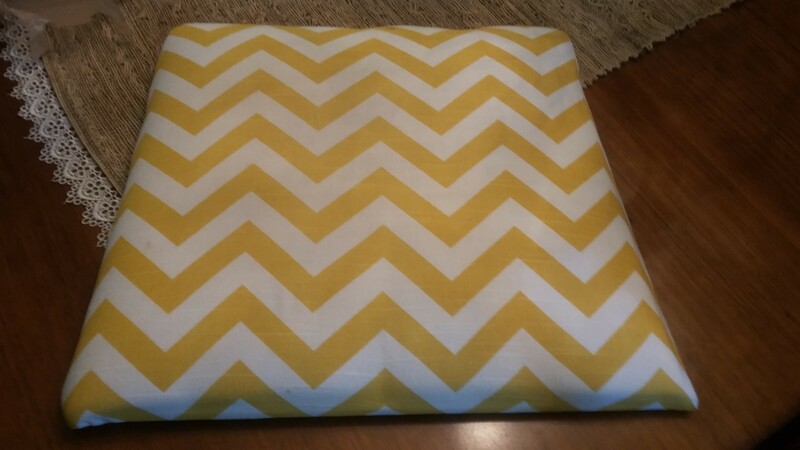 My mom suggested I bring one of the cushions into the store when purchasing the fabric, so I did as I was told and the lovely lady at Hancock’s was able to estimate how much fabric I would need to recover 6 cushions. Now I’m pretty good at math but I’m also pretty confident that I would not have purchased enough fabric, so thanks for the tip Mom. First up was removing the rest of the cushions so the chairs could be sanded and stained. 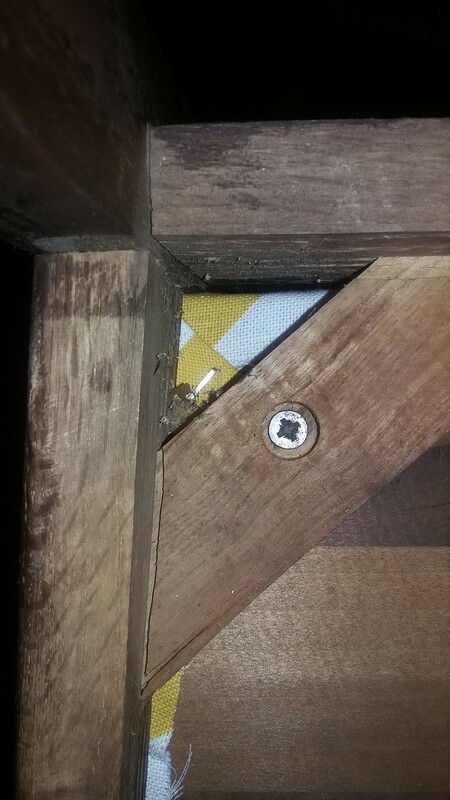 Luckily each cushion was held in place only by 4 screws underneath, so a Phillips Head screwdriver was the one tool I needed to accomplish this. The first step for the cushions was to remove the lovely black vinyl. This was not an easy task as there were like a million heavy-duty staples and nails to remove, but I got it done. I then used the vinyl I had removed to trace the shape of the cushion cover onto my new and improved fabric. Then came the cutting – I should mention here that I purchased some fabric-grade scissors while at Hancock’s, and let me tell you that they were well worth the $20. The next step was to lay out each fabric piece upside down on a table and place the remainder of each cushion on top of the fabric. By ‘remainder’ of cushion I’m referring to the wood board that acted as the bottom of each cushion and the foam insert. 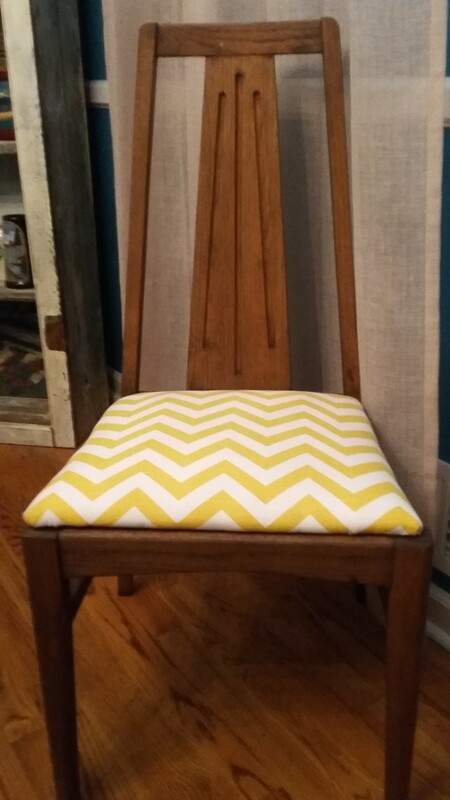 While at Hancock’s I also purchased some polyester fiber fill because I wanted the cushions to be a little more cushion-y, if you will. 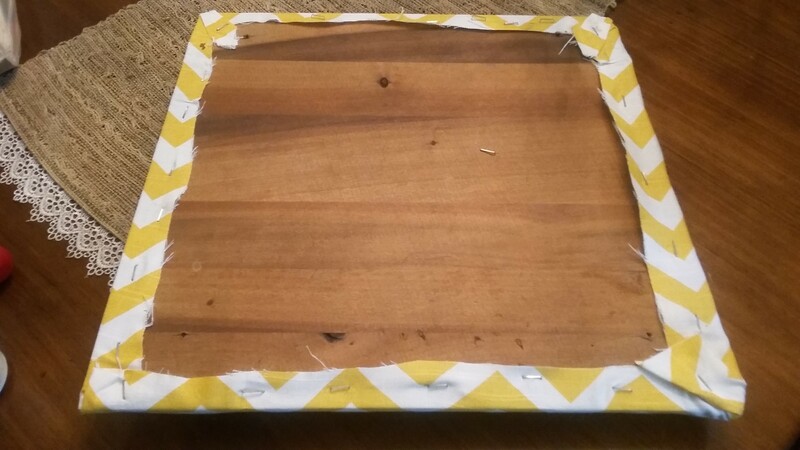 I just added a very small layer of this between the foam insert and the wood board.